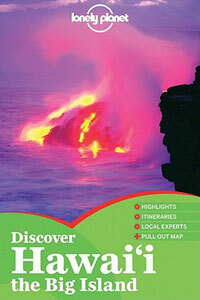 Big Island Guidebooks: Which to choose? 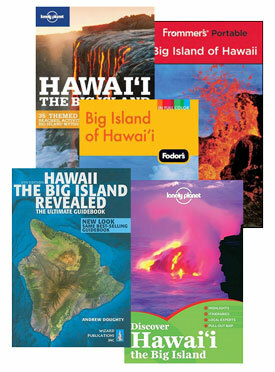 Choosing from all of the Big Island guidebooks out there can be a daunting task. A quick search on the website of your favorite online bookseller will probably come back with thousands of results. So, what do you do? Pick one with a nice looking cover and hope for the best? Comb through the hundreds of reviews? Buy a few and flip through them before deciding which one you like and will actually use? Let me save you some trouble. Among all the Big Island guidebooks out there, for me, there's one that really stands out. It's exactly what a good guidebook should be: informative, easy to follow, fun to read, funny and full of great color pictures and maps. Hawaii The Big Island Revealed calls itself "the ultimate guidebook" and it really is. This is my go-to Big Island guidebook and I can't say enough good things about it. But, besides being a fun and enjoyable read, this book really gives you an inside look at the island. Apparently even a little too much insider information for some people's liking — They describe a wonderful hike to a Big Island volcano vent on a public trail that happens to be outside of the boundaries of the Hawaii Volcanoes National Park. Well, park officials (who had previously called the guidebook "the most accurate book we've ever seen for the Big Island") wanted the publishers to remove the hike from the book and they refused, resulting in the book being taken off the shelves of the park's gift shop—a little too accurate for some people I guess! This book can be hard to find an your local book store since many only carry the bigger names in Big Island travel books (if any). You can easily pick up a copy at various Big Island booksellers but, since one of the great things about a guidebook is that it makes great pre-trip reading, I suggest buying a copy online. The latest edition is also available in the Amazon Kindle edition, the Barnes & Noble NOOK edition, and the iBooks edition for your favorite Apple iDevice. And they've recently released a handy companion iPhone app that includes built in maps that help you navigate your way around the island precisely and without using cellular data. Check out my reviews of Big Island smartphone apps for more on the best apps available for iOS and Android. Because I honestly think that Hawaii The Big Island Revealed is the best, it may seem anticlimactic to review other Big Island guidebooks. But there are a number of other reliable guides that I own and have used over the years. 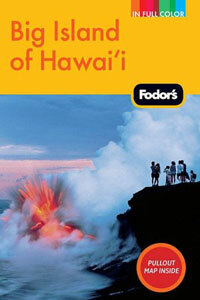 Fodor's Big Island of Hawaii — My in-laws love to travel and swear by Fodor's travel guides. I've found their Big Island guidebook to be pretty useful and their most recent edition has finally made the welcome jump to full color. It's written by a team of authors who specialize in particular aspects of the Big Island that appeal to different visitors. A Big Island golf expert writes about golf, a Hawaiian foodie write about restaurants, etc. It features good maps and some color photos but the real added value of the Fodor's Big Island guide is the tear-out fold up map at the back. For those who appreciate a good fold out map that you can spread across your dining room table to do your vacation planning, this one is a good one. Lonely Planet's Discover Hawaii the Big Island — I've always been a fan of the Lonely Planet's guidebooks and TV shows, and their Big Island guide is a good one. 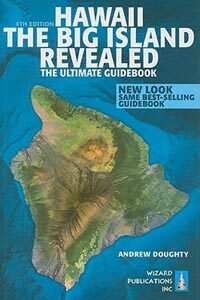 Also updated to full color in recent editions, this book is similarly compiled by a team of seasoned travelers and Big Island local experts. It certainly lives up to Lonely Planet's reputation for providing the kind of no nonsense and reliable advice that savvy travelers have come to appreciate from them. The latest edition weighs in at a whopping 416 pages. The previous edition is still full color but follows the slimmer, more portable form factor of the earlier black and white Lonely Planet guides.